March 8, 2016 – In celebration of WRAP’s 19th Birthday, Mary Ellen Copeland answers your questions about WRAP. February 2, 2016 – In this webinar, Mary Ellen Copeland invites you to walk with her, step-by-step, through the process of identifying signs that “things are breaking down”, and of developing a strong and effective action plan. Then she will share many strategies she has discovered from others that make it easier for you to actually use your plan. 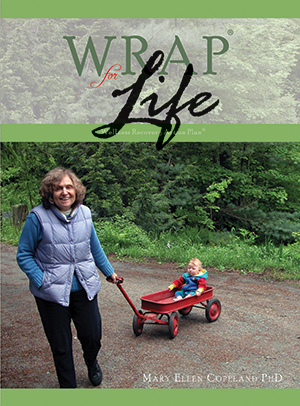 September 10, 2014 – Mary Ellen Copeland presents her new book, WRAP for Life in a one hour webinar. The presentation concludes with a question and answer session with Mary Ellen. June 21, 2012 – Join Mary Ellen Copeland as she walks you, step by step through the process of developing an Advance Directive, or Crisis Plan, a plan which you develop for yourself, or with the assistance of others, that instructs others on how to provide you with care and support when you are having a very difficult time. Most of us like to keep our lives under our own control. However, unanticipated circumstances such as the onset of severe mental health difficulties, a life tragedy, an illness or an accident, can and do occur in everyone’s lives. If you have an Advance Directive it will tell others what to do and when to do it, keeping you in control even when it seems like things are out of control. June 14, 2012 – Author and journalist Robert Whitaker joins mental health educator Mary Ellen Copeland for this important webinar. Respected and rigorous research is showing that mental health challenges are “episodic”, which means that they go away over time. Psychiatric medications can cause long term health problems like diabetes, obesity, and sexual dysfunction. These problems do not necessarily resolve when the medications are no longer being taken, and the mental health issues may become more extreme than before. Robert Whitaker gives an overview of his important work, Anatomy of an Epidemic. As he searched for answers to the troubling question of why the number of people with mental health challenges in the US had tripled over the past two decades, his investigation led to an intensive study of the merits of psychiatric medications and his documentation of the phenomenon that occurs when people who have been taking medications for a long time no longer take them. He found that they experience mental health challenges that are far worse than anything they experienced before they began taking the medications. Mary Ellen Copeland shares her vision of a mental health system where people who reach out for assistance and support are first encouraged to use their own personal resources to find simple, safe solutions to their mental health challenges. She will speak specifically to the efficacy of using the evidence-based Wellness recovery Action Plan as the initial and primary support on the journey to recovery. May 24, 2012 – Mary Ellen Copeland explores how people use WRAP daily as their guide to recovery and wellness. Her presentation includes stories that she has gathered from people around the world who use WRAP; stories that illustrate the challenges of using WRAP, and the power of WRAP in helping people to improve the quality of their daily lives and going on to meet their own goals and dreams. April 26, 2012 – Join author, educator and mental health advocate, Mary Ellen Copeland, PhD, as she takes us through a basic overview of WRAP®. 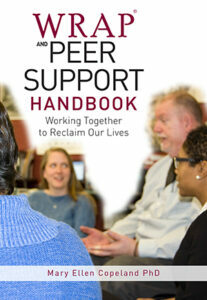 She will describe the five key concepts- hope, education, personal responsibility, self-advocacy, and support. Mary Ellen will describe the sections of WRAP: Wellness Tools, the Daily Maintenance Plan, Triggers and Triggers Action Plan, Early Warning Signs and Action Plan, When Things are Breaking Down, Crisis Planning/Advance Directive, and Post Crisis planning. She will also talk about the Values and Ethics that are fundamental to WRAP. The presentation will be followed by a live question and answer session. This webinar is appropriate for anyone who wants to learn more about WRAP, either for themselves or to support others.